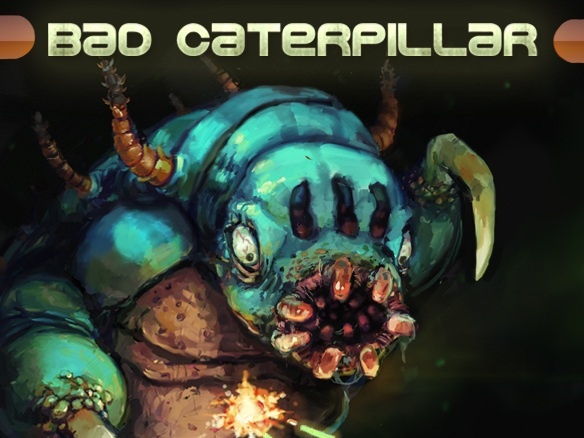 The good folks at Fun Infused Games, a dev we first started following back during the Indie Uprising, contacted us not long ago about their latest tile, Bad Caterpillar. Considering the fresh takes of retro styles we’ve seen them produce in the past, I was eager to see what they came up with this time. 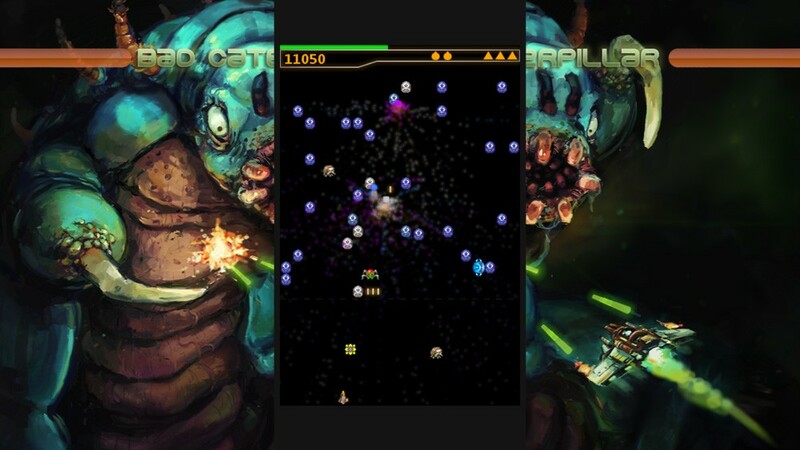 Bad Caterpillar has an unmistakable arcade feel. The gameplay itself is old school low-resolution pixels. There are a few updates to the graphics—particle effects for example—but otherwise the classic arcade feel is maintained. Take a look at any of these screen shots and I think you’ll agree that the Centipede influence is clear and faithfully emulated. I particularly enjoy the high quality wrap around artwork that bears virtually no resemblance to the actual graphics. Think back to every arcade machine you’ve seen. For some of you, this may be a very small number, I realize. For the rest of you, I think you can agree that the chances of anything beyond the title screen looking even remotely like the artwork advertized on the machine itself is practically zero. In my mind, that title graphic and its presence on either side of the display is at least as good of a reference as the ridiculous cover for Megaman 9. Now, I’m something of a retro game fan, so I’m willing to embrace a few pixels and some oddly shaped screens. The individual graphic elements are very small, and with only a few pixels to go by you might not be able to tell precisely what it is you are looking at, but the raw materials for gameplay are all adequately represented. Each type of enemy is clearly differentiated, the power ups are distinct, and the UI is clear and easy to read. Folks used to high-def, panoramic visuals are likely to be underwhelmed, but naturally, it comes down to a matter of taste. The came plays, predictably, very much like centipede. You control a space ship cruising around firing lasers, and various space insects are determined to end your ill defined space exploration career before it begins. The titular caterpillar crawls down the screen, zigzigging through the destructible doodads that speckle the screen, and destroying any segment splits it onto two separate conga lines. Spiders, scorpions, and other insects and arthropods each have their own attacks. A pretty vanilla implementation of Centipede so far, but this is the point where things start to differ. Some segments of the Bad Caterpillar are clearly different from the rest. When you destroy them, a power up drops, ala Arkanoid. These power ups come in the form of weapons, like the spread shot or the target penetrating railgun, bombs (which fire out and do blast damage when they hit their target, or gameplay altering power ups like “reverse” which sends the caterpillar back the way it came. Weapon power ups have a little meter indicating how much ammo they have left, bombs are tallied with little icons. You actually have a few different characters to play as, all of whom have different stats such as weapon capacity. Standard stuff, but well implemented and very welcome. Some other additions to the gameplay include the separation of the game into levels. 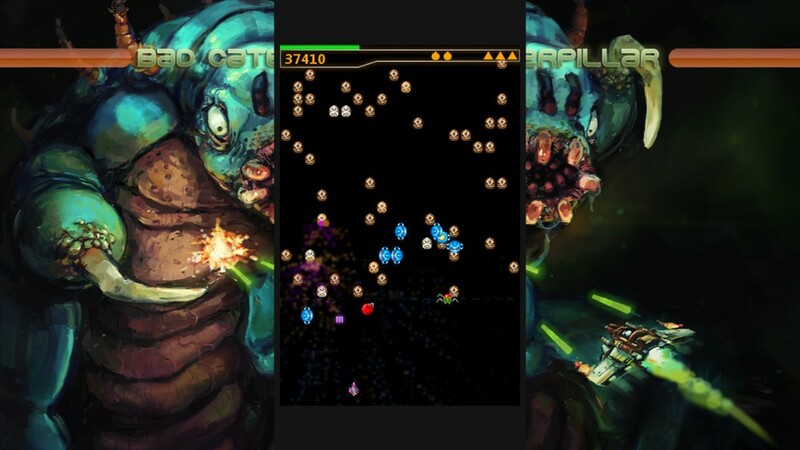 As soon as you destroy the last segment of the current caterpillar, you finish the level. Shots fired, score, and accuracy combine to give you a letter grade and an insect title. The grade is a handy motivator, though I’m not up enough on my entomology to know how a grub compares to a worm in terms of combat prowess. If Centipede had come out a few years later, when games had evolved in both concept and capability, this is the game it would have been, plain and simple. This is a weird one. The soundtrack is equal parts rockin’ tunes and boops and bleeps. … That’s really all I can say. AHHHH! SPACE BUGS! KILL THEM! If I was going to brainstorm the sort of features that would elevate Centipede back to a position worthy of sale today without completely abandoning the gameplay that made it work, this is precisely the game that would have resulted. Well done. It should appeal to retro-nuts, but also still has enough gameplay to fit in to a modern smartphone game roster… which makes sense, since it is slated to show up on iOS. 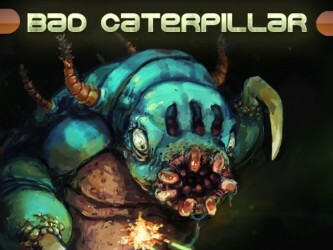 8.0 / 10: Bad Caterpillar is an evolution of the classic Centipede gameplay, with plenty of excellent additions.